Bhopal : The much awaited song 'Malhari' from Sanjay Leela Bhansali's historical romantic movie 'Bajirao Mastani', has been launched now after 'Gajanana', 'Deewani Mastani' and 'Pinga'. The song is fourth song from the movie which has been launched in Bhopal. Ranveer Singh, who is in the lead role in the film, was in the city to launch victory song as the region is of great significance to the warrior's story, was thronged by fans as he arrived in the city. The makers thought Bhopal to be the ideal place to launch this track as Bajirao won one of his biggest wars here. The Battle of Bhopal is one of the biggest battles of the 18th century, which resulted in Maratha victory, mainly through the swift tactics of Maratha Peshwa Bajirao. 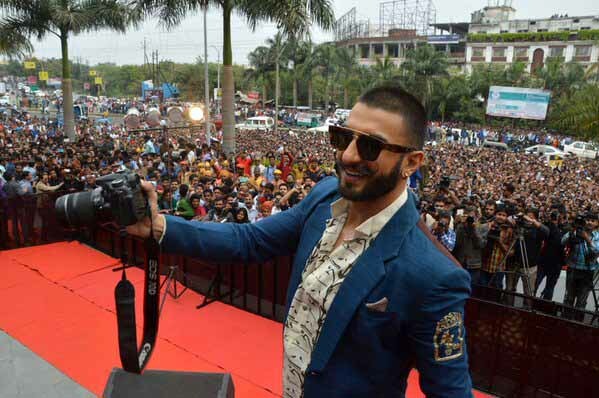 Dressed in blue dhoti pant, printed shirt and blue jacket, Ranveer performed to 'Malhari' amidst crazy fans cheering for him at the venue. The song, which is shot on an extensive scale, is sung by Vishal Dadlani and choreographed by Ganesh Acharya and signifies victory and celebration. In the period drama, the 'Malhari' track comes after a crucial victory that Bajirao and his soldiers celebrate. Earlier, an excited Ranveer had took to social media to share a teaser of the song, writing, "So I'm in Bhopal readying 2 rage at the # MalhariLaunch ..Meanwhile y'all good folks can nibble on this little teaser!"